Cocktails with… Death’s Door Gin – from Wisconsin, USA! Some years back, I spent a little time in Madison, Wisconsin and I have a very good friend that lives there, so I have rather a soft spot for the Badger state. 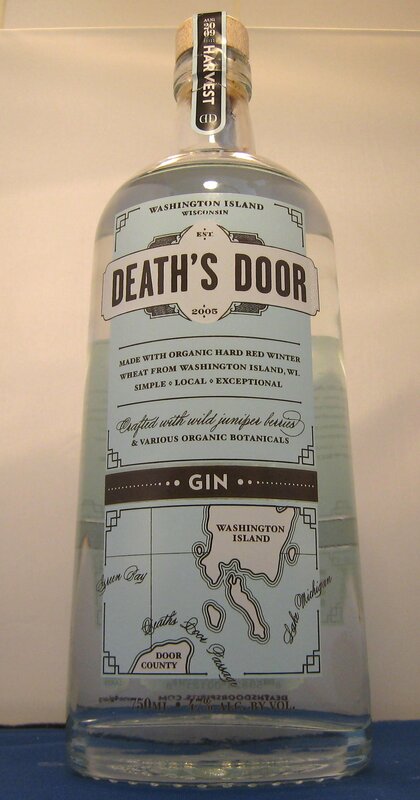 So, when I found out about Death’s Door, a Gin from Madison, Wisconsin, my interest was piqued. Death’s Door also make a very tasty vodka and a White Whisky. #1 Neat: There’s a touch of juniper and coriander on the nose initially, followed by some pine & fennel, somewhat reminiscent of a forest.When drinking it, I found that the gin is quite warm with juniper up-front, and fennel and anise on the finish, which gradually gets sweeter. This reminds me of the pizzeria in my home town and, thus, I was inspired to accompany sipping this with some fresh green olives; I can confirm that they were rather tasty partners. #2 Gin & Tonic: Quite sweet with an interesting, but good, combination of the juniper/quinine bitterness and the fennel. Citrus is present but more subtle then in most Gin & Tonics. This drink is best with lots of ice and it is exceptionally refreshing; it doesn’t even need a garnish. #3: Martini: A surprisingly crisp Martini, with juniper and fennel flavours early on. If you imagine a classic Dry Martini and then add a layer of fennel/anise flavours on top of that, you have a Death’s Door Martini. I like it but some may find the fennel too dominant. #4: Gimlet: A different take on the Gimlet with this drink. It is cool and refreshing but the fennel does dominate a touch too much for my liking; some adjustment of the proportions may improve this cocktail. #5 Aviation: OK but lacking in flavour. There are some herbal and citrus notes but the drink still needs more character. It’s possible that using Creme Yvette rather than Creme de Violette would improve things. #6 John Collins: Tastes like a Collins that has been made with anise syrup rather than simple syrup. Easy to drink with a nice bite of citrus. Is it a typical Collins? No. Is it tasty? Yes! #7 Gin Bump: The flavours clash rather badly, any subtleties are lost and it is also too sweet. Certainly not the best way to enjoy the gin. #8 Bramble: A classic example and very refreshing. All the flavours are well-balanced and no one element of the drink overpowers the others. Very good indeed. #9 Negroni: I’m not usually a fan of Campari but Death’s Door Gin seems to hold it’s own against the bitter aperitif. This drink is fresh, cutting and extra bitter. If like Negronis, try this. #10 Gin sour: This is sadly not a great way to enjoy this gin; there is no harmony between the ingredients and the lime dominates. #11 Milano: The herbal notes of the gin and the Galliano are perfect partners and the lemon juice stops the mixture from being too sweet. This is delightful with some subtle anise on the finish. #12 Gin Old-Fashioned: The sugar, water and bitters really mellow out the fennel notes of the gin. This drink is smooth with a balanced flavour and a lovely bitter-sweet streak at the end. Immensely sippable. 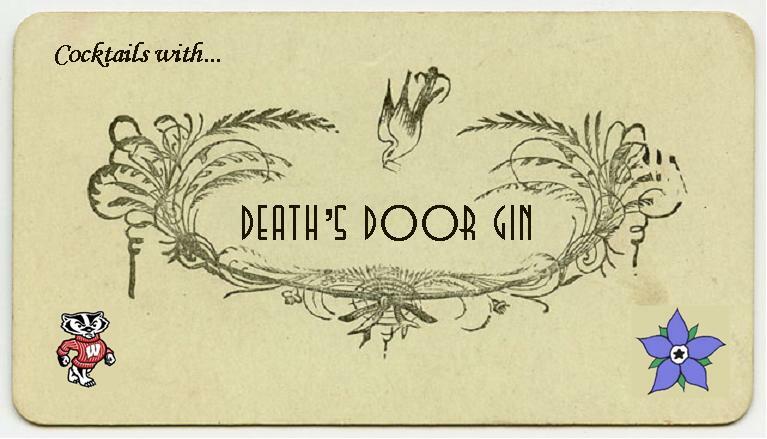 Even though Death’s Door Gin only has three botanicals it is certainly flavourful. The fennel does make itself felt in many of the drinks we mixed and is certainly a distinguishing characteristic of the gin. However I think rather than try and hide this quality oif the gin, it is better to embrace it as your would the anise notes of other products such as absinthe. A gin Sazerac or TNT cocktail would, I think, work well. Of the selection we tried The Old Fashioned and the Gin & Tonic were easily my favourite. *Death’s Door Gin uses a 60:40 mix of organic Washington Island wheat and organic malted barley from Chilton, WI. This entry was posted in Product Reviews and tagged American Gin, corriander, Deaths Door Gin, Deaths Door Gin Review, Deaths Door Spirits Company, Deaths Door Vodka, Deaths Door White Whiskey, fennel, Fennel Gin, Gin, Gin & Olives, Gin Review, gin tasting, Go badgers, Juniper, MAdison, The least botanicals, Three Botanicals, University of Wisconsin, USA Gin, Washington Island, White Whiskey, Wisconsin Gin by DTS. Bookmark the permalink.